LeapIN has been helping people start and run their Estonian companies since 2015. We're still relatively young as a business, but we know what we do, and we do it well. We'll help you set up your business, get your Estonian bank account, and then take care of the day-to-day administrative hassles of the business. In our 3 years, we've welcomed over 1400 customers, from nearly 100 different countries. And that number is growing daily. They've all become founders of their own Estonian companies, and some haven't even stepped foot in Estonia. Not for business reasons anyway, but no doubt they'll come to appreciate the country's natural beauty as soon as they visit. And like any customer focused business, we get hundreds of questions every day from both potential and existing customers, covering a variety of topics. So we decided to put together this list of fifteen important things you should know before taking the leap with us. Ok, so the first one is the obvious one. It's important to know that you can sign up with LeapIN before even applying for e-Residency. 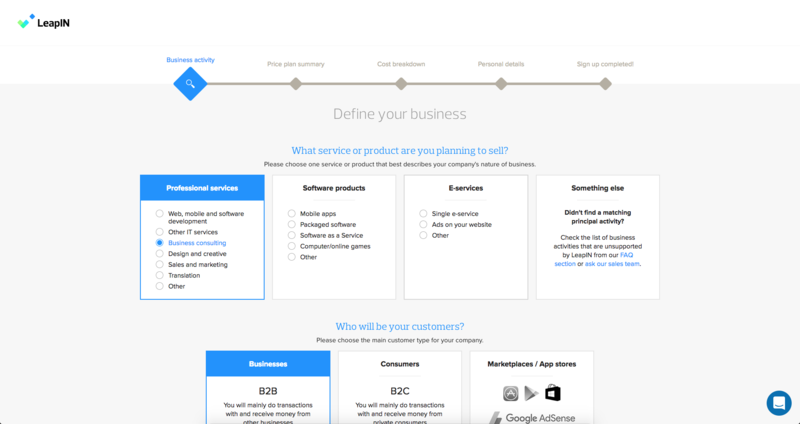 You won't need it straight away when you sign up, and you'll be able to choose your company's name, outline what you'll do, get any questions you have answered and even get an answer whether LeapIN can support your business model. In case we can't, we'll happily suggest an alternative way forward, and even another provider if we know of one. Companies who require a licence in Estonia, including - financial services (incl. crypto-currencies), travel agencies, energetics, the sale of alcohol, gambling etc. When you sign up and tell us what your business will do, we'll let you know which plan we think is best tailored to your needs. You'll also only be charged €49 per month, until you've made over €1000 in revenue (VAT of 20% is added to all prices). Our full pricing plans start from €59 per month, and you can see all 3 plans on our pricing page. You can start applying for your Estonian e-Resideny before, or after you've signed up with LeapIN, it's totally up to you. You can do this from the e-Residency website, and it'll cost you a one-off fee of €100. This will give you access to all the necessary online services the Estonian government provide for running your brand new business, along with easy ways to access banking services and LeapIN. It's a worthwhile investment. There are currently close to 35,000 e-residents of Estonia, with almost 3,500 new companies established in Estonia. e-Residency even lists all of their statistics publicly so you can keep an eye on them if you're interested. You'll be able to complete the full application online, and choose where you'd like to collect your ID card. This will be at one of the many Estonian embassies and consulates around the world, or in Estonia itself. During the application, you'll need to submit a copy of your existing ID document (for example, your passport), and you'll then need to take this same document with you when you pick up your card. Your fingerprints will also be digitally scanned when you collect the card, which is why you need to collect it in person. 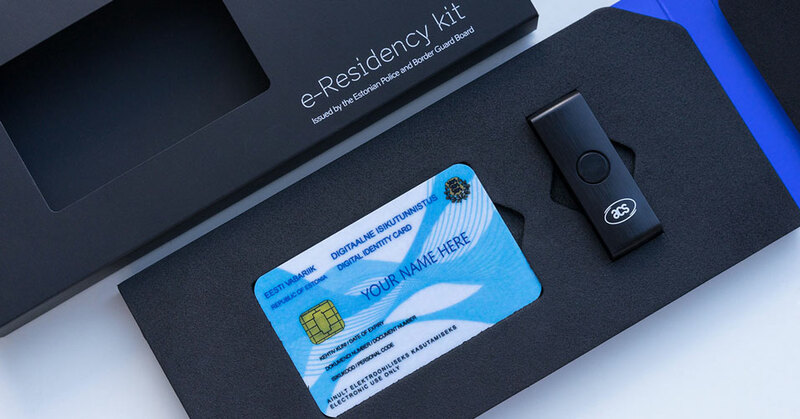 The whole process shouldn't take more than 1 to 2 months from submitting your application to collecting your e-Residency ID card and starter kit. Admittedly, if you know exactly what your company to be called already, this may seem like a trivial step. But this is a big choice, and one of the first steps when you sign up. This is the name of your company and you want it to be impactful and memorable. You could of course just use your own name, something like 'John Smith OÜ', if you'll be acting as a freelancer, as this will be trustworthy for your clients and easier for you. However if you're looking to create a brand which isn't just your own name, it's great to try and pick a name which represents what your business does in some way, or something which will stick in people's heads. And don't forget to do research around what other names are out there already. There may not be a company with exactly the same name, but if there's a company in Europe with a similar name it could cause confusion. We've written a blog post dedicated to this in case you need further guidance. We mentioned this briefly in point 1, but during our onboarding process, we ask for your business description. This is where we want to know all about your business - exactly what it will do, what services you'll offer, how you're planning to deliver your services. We really want to know as much as possible about the business. And it's important to be transparent, the whole concept of e-Residency is transparency and ease of doing business, so your company data will be publicly available. There are also strict money laundering regulations and you can't be hidden or detached from your company in any way. Your business description also helps us to figure out if LeapIN is a good fit for you, and if your business can be supported by us. It's also submitted to our partner bank LHV (as part of your application for an Estonian bank account), the Estonian business registry, and the Estonian tax board. Everyone involved will assess it diligently, so you need to consider this as well when completing your description. As mentioned above, we'd strongly suggest opening an account with our partner bank, LHV. They've been around since 1999, and now have more than 100,000 customers using their banking services. We have a close co-operation agreement with them, and using their feature LHV Connect, you'll be able to view your up-to-date business bank account balance on your LeapIN dashboard. To get your account, and bank card, you'll need to make a trip to Estonia to meet a representative of LHV and sign on the dotted line. And you'll also get to meet the wonderful LeapIN team, so what could possibly be better? Don't fear though, if you're not able to travel to Estonia for any reason, you're not out of luck. You do have other options. You could also get a TransferWise borderless account, or an account with Holvi, to function as your primary business account. It's even possible to get both of these accounts anyway, to use alongside your LHV account. And if you're selling services online, you'll likely want a PayPal business account as well, as they're one of most recognised online payment providers out there. And getting a PayPal business account is easiest once you've got your LHV business account, as PayPal require that you have an Estonian business bank account to link to your account. This can also work with Holvi, as your account with them may be considered your business bank account. For more detailed information about your business banking options as a LeapIN customer you can read our blog post about it, or consult our FAQs. The minimum share capital for an Estonian limited company is €2,500. Don't worry if you're not ready to pay it when the company is being established, as you can choose to defer the payment for as long as you want if the share capital is under €25,000. However, you'll need to do it before you make any dividend payments, and you're still personally liable for your company up to the amount of share capital not yet paid in. And you'll be glad to hear that this is an easy process in Estonia. When you're ready, simply make the payment directly into your company bank account and label it 'payment of share capital'. It's important to understand that e-Residency doesn't equate to tax residency. If you're an e-Resident of Estonia, and you've established a company here, it doesn't mean you'll need to pay personal taxes within Estonia. We'll talk more in the next point about the two types of salary you can pay yourself, the board member and employee salaries. LeapIN currently assumes that your Estonian company will be an Estonian tax resident and provide you with the necessary tax compliance and reporting in Estonia. Estonian policies on company income tax are quite unique. Company income tax (CIT) is charged on distributed profits (dividends) only and not on the company's income. Distributed profits (dividends) are generally subject to a flat 20% CIT at 20/80 of the net amount of profit distribution. There is a lot more detailed information in our FAQs, and an excellent e-Residency blog dedicated to taxes for e-residents. The board member salary is subject to personal income tax (20%) in Estonia, independent of whether the actual duties were performed in Estonia or abroad. Double taxation can be avoided by the relevant agreements between Estonia and your country of residence (see the list of countries here). This salary is also subject to social tax (33%) in Estonia unless you can provide evidence that you are already paying social contributions in another EU country (A1 form, formerly E101). In the latter case, no social tax applies in Estonia. Employee salary - if you perform all your work outside Estonia (and are treated as a non-resident), no personal income tax nor social tax are paid on employee salary in Estonia. In that case, you're responsible for paying taxes in the country where you are a tax resident as an individual person. In case of interest, you need to be able to prove to Estonian authorities that the real work was performed outside of Estonia. However, your tax arrangements abroad are not their concern. You can see more information in our FAQs about receiving money from your company. If you sign up for LeapIN, then we'll take care of all your day-to-day accounting and taxes, along with your annual reports. And you can view and manage everything in your self-service dashboard. This doesn't mean there's nothing for you to do though - you'll still need to create, or upload, invoices for all incoming payments, and upload expense documents for all outgoing payments. This ensures that we can keep your company financially compliant, and you won't have any issues with the Estonian tax board. You won't need any third party software to deal with, or create, your invoices when you're a LeapIN customer. You'll be able to create and send invoices from your self-service dashboard, and there are basic settings so that you can customise the design of them. Creating a new invoice is immensely simple, just go to the "Cash in" section of your dashboard, and click "New sales invoice". Fill out all the fields and a new sales invoice will be created. Done. 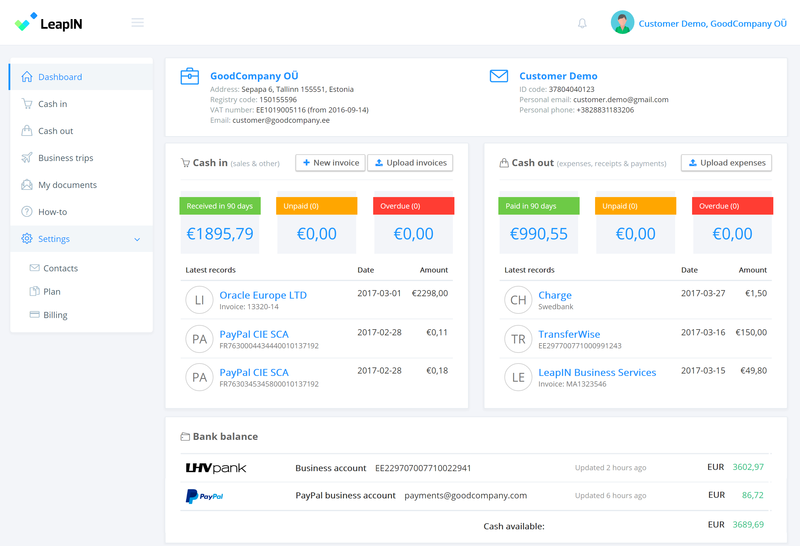 There's also the option for us to create an invoice for you manually if needed, with a quick email to support@leapin.eu. We'd definitely prefer you to create the invoice using our self-service invoice creation tool though. Much easier for you and us. Arguably one of the best things about opening your company bank account with LHV is needing to take a trip to Tallinn, Estonia. And whilst we realise this can be a bit of an inconvenience, you don't need to make the trip right away, you can organise it at your convenience and travel when it's best for you. You also don't have to stay long if you don't want to - we've had customers stop by from Brazil and go back on the same day! We'd definitely suggest staying for a few days though, to take in some of the beautiful sights and sample some of the excellent food. Tallinn is an eclectic, up and coming city, in one of the most digitally advanced countries in the world. It's a great destination for business and pleasure, and we're sure it'll prove it! We've written a blog with all our best tips when you're visiting Tallinn for the first time. Starting your company with LeapIN doesn't just mean you have an Estonian company, it's also a company based within the European Union. This means your company will have access to the EU single market, and all the advantages it brings. You'll be able to do business with customers in Estonia, as well as the other 26 member states with no issues whatsoever. And if you're from the UK it gives you a secure option to keep your business in the single market, in case the Brexit process affects this. We even have a blog about the benefits of e-Residency in relation to Brexit. One of the main features of your e-Residency is the digital ID card that you'll receive when you sign up. Once you've collected this, you'll need to put it to good use, when you sign your company registration application with LeapIN. To make digital signatures, you'll need to use your ID card with the card reader that you'll also receive in your e-Residency starter pack. Your ID card can also be used to sign into your Estonian banking services once you've set them up, along with the LeapIN dashboard. You'll also need to download the ID card software here and you can always consult our FAQs about ID cards, or the FAQs on the ID card website. We also highly recommend downloading the excellent app Smart-ID. You use your ID card and reader to sign up with Smart-ID, and from then on you can use Smart-ID to log in to your services, as well as authorise payments from your Estonian bank accounts. This means that you can manage everyday things with Smart-ID and only use your ID card for signing your annual report once a year. You can even read our separate article, all about Smart-ID and it's advantages, and why perhaps it's even more accessible than your ID card. Just in case you were a little worried - no, you don't need to learn Estonian to run your company. Estonians have excellent proficiency in English, and as LeapIN will be taking care of the bureaucratic business for you, you won't have too many dealings with Estonian authorities anyway. You might get a few emails from government institutions, but you can forward them on to us, and we'll let you know if there's anything relevant. In case you are a little interested though, the Estonian government does offer a free crash course in the language online, so feel free to have a go! 15. Start enjoying your location independent lifestyle! Well, that about covers everything you need to know when signing up with LeapIN. All you need to do now is sign up, and start enjoying your professional freedom! Once you've taken a trip to Tallinn, how about Tokyo next? Or Tbilisi? Maybe even Tampa? Or Tirana? It's entirely up to you, you'll always have access to your company online, and you're in great hands with LeapIN. So what are you waiting for? Take the leap!